6am - 5.30pm. Last entry to Machu Picchu at 4pm. Open everyday including public holidays, Christmas and New Year. Maximum capacity 2500 visitors per day. Entrance ticket prices for 2017 shown below are for overseas visitors. Discounts are available for Peruvians and some South American nationals. There are cheaper tickets available for Peruvians. Children under 8 years old enter for free and do not require an entrance ticket as long as they are accompanied by an adult and carry their passport. Children & teenagers between 8 and 17 years old receive a 50% discount and must carry their passports. Students over 18 years old receive a 50% discount and must take their passports and valid ISIC cards (International Student Identity Card). Tickets prices have been taken from the government website www.machupicchu.gob.pe and valid for 2017. Prices may be subject to change so please check the website for up-to-date information. 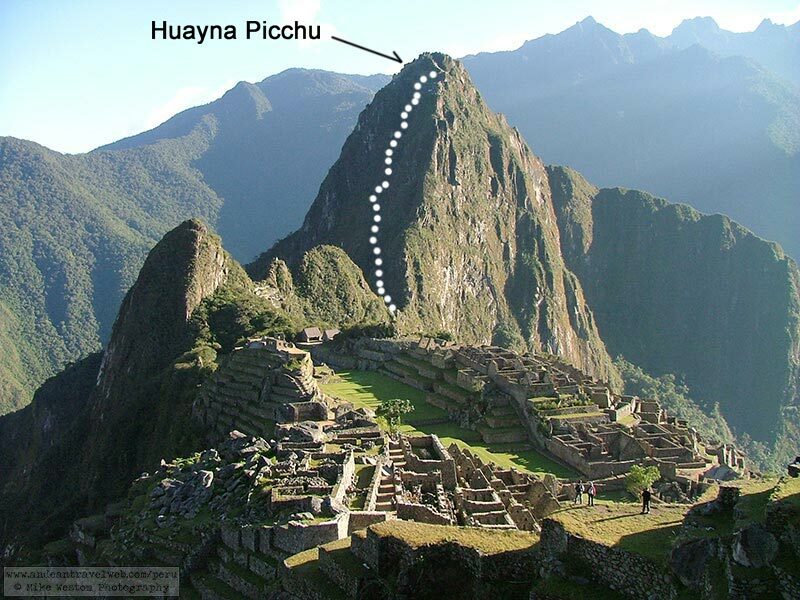 Huayna Picchu is the large mountain you can see behind Machu Picchu as indicated in the photo below. 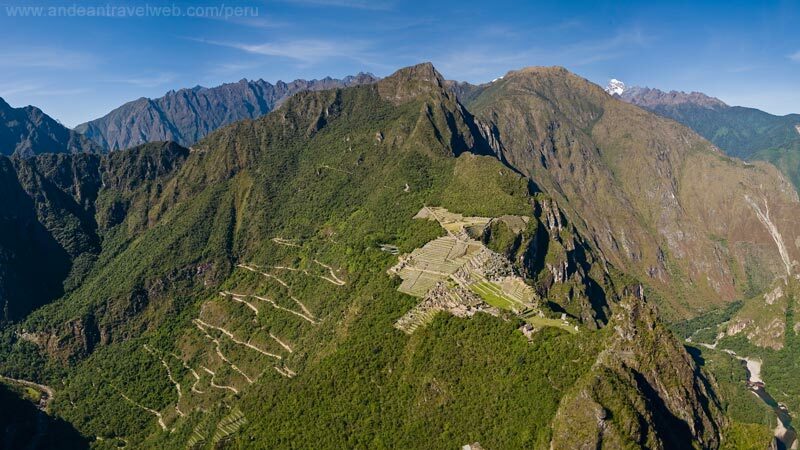 There is a steep and narrow path that leads up the mountainside and some interesting Inca ruins on the top from where you can get some spectacular views of Machu Picchu and the surrounding Vilcanota Valley. You obviously should be quite fit to make the climb and not be scared of heights. Allow 2 hours to get up and back. You can't buy a ticket just to climb Huayna Picchu, you can only buy a combined Machu Picchu and Huayna Picchu ticket. A maximum number of four hundred persons per day can climb Huayna Picchu. Two hundred people are allowed to start the climb between 07:00 and 08:00 (Group 01) and must return by 10:00. Another two hundred people are allowed to start the climb between 10:00 and 11:00 (group 02) and must return by 13:00. When buying your Machu Picchu + Huayna Picchu tickets you have to state which group you want to be in. Machu Picchu Montaña is the large mountain that overlooks Machu Picchu. 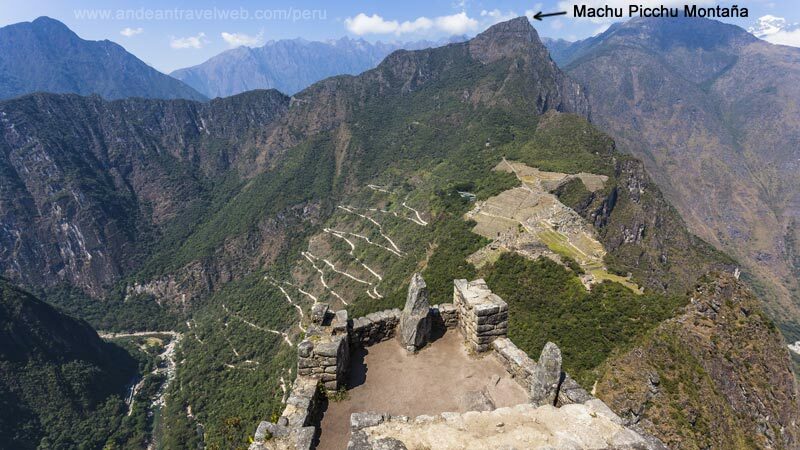 Its indicated on the photo below which has been taken from the top of Huayna Picchu. You can even see Salkantay mountain in the top right hand corner. Allow 3 hours to get up and back (1.5 hrs up, 30 minutes at the top and 1 hour return). You can't buy a ticket just to climb Machu Picchu Montaña, you can only buy a combined Machu Picchu and Montaña ticket. A maximum number of four hundred persons per day can climb Machu Picchu Montaña. Two hundred people are allowed to start the climb between 07:00 and 08:00 (Group 01) . Another two hundred people are allowed to start the climb between 09:00 and 10:00 (group 02). When buying your Machu Picchu + Montaña tickets you have to state which group you want to be in. View of Machu Picchu from the top of Machu Picchu Montaña - taken with a telephoto lens. 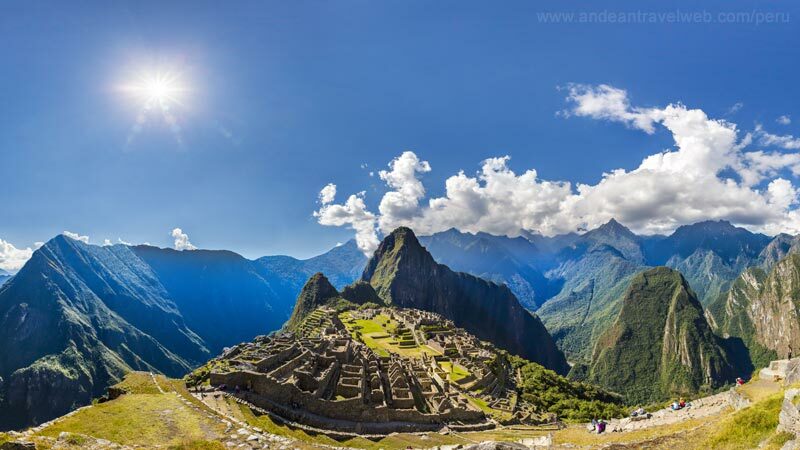 You can buy Machu Picchu tickets online using the official government website www.machupicchu.gob.pe Visit our web page Buying Machu Piccu Entrance Tickets Online for information and help using the website as it can be a bit confusing. Although there are literally hundreds of travel companies in Cusco that have a license to sell Machu Picchu tickets very few offer just the entrance tickets on their own, obviously they want to sell you a package tour that also includes the train tickets, bus tickets and guide. There are a couple of online agents just selling the tickets but its hard for us to recommend one in particular. 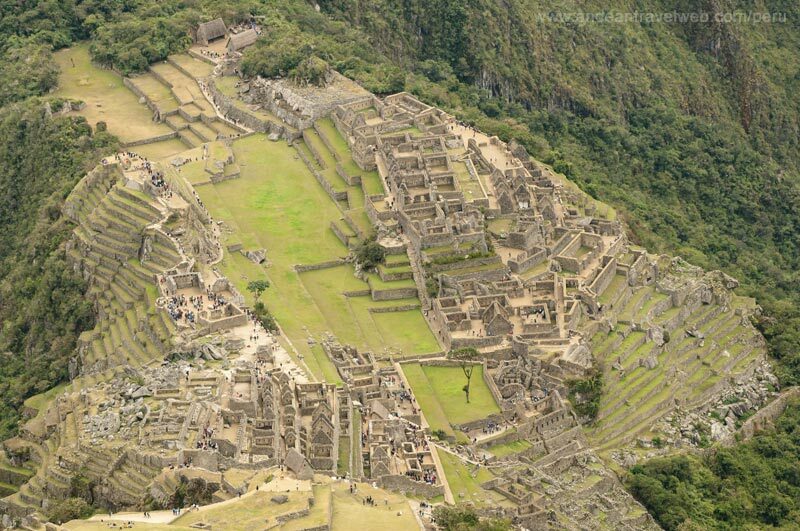 If you are arriving in Cusco a few days before planning to visit Machu Picchu then you could buy your Machu Picchu entrance tickets at the government office or through an authorized agent such as with PeruRail. In the low season November - March (excluding Christmas and New Year) then it should be possible to buy your entrance tickets two or three days in advance, maybe even one day in advance if you are lucky. During the high season May - September entrance tickets can sell out three or four days in advance so unless you have plenty of time it's best to book online several weeks in advance to avoid disappointment. If you want to buy a student or child entrance ticket this is the place to go. Remember to take your passport as you'll need to show it to buy the ticket. Alternatively to can buy your Machu Picchu entrance ticket at the Peru Rail offices in the main Plaza de Armas. Address: Portal de Carnes 214, Plaza de Armas, Cusco Opening hours Monday to Sunday 7am-10pm. PeruRail also have offices at Lima Airport (National Departures, 2nd floor, between Gates 13 and 14 open 4am-8pm) and also at the LarcoMar Shopping Center in Miraflores open 11am-10pm. 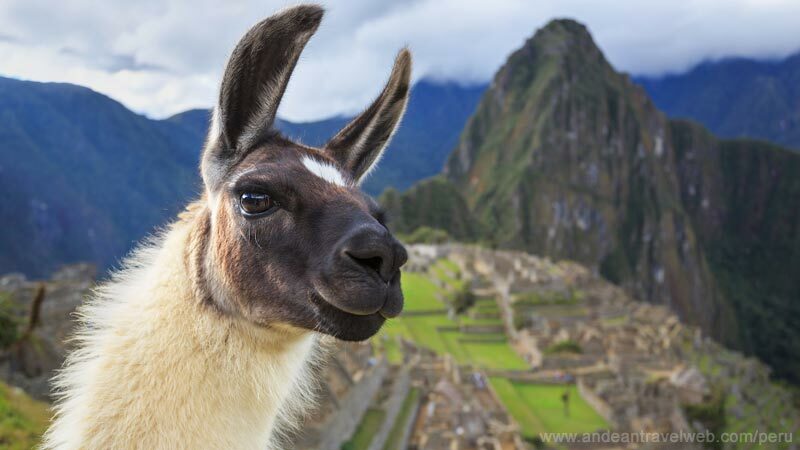 * Machu Picchu entrance tickets will only be sold to customers who have purchased train tickets with Peru Rail.